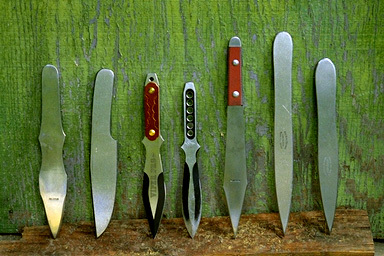 Left to Right, some custom knives from Lowcountry (B. Branton), R. Lee, a pair of Vipers from H. Moeller, another Branton, and a pair of Karps. 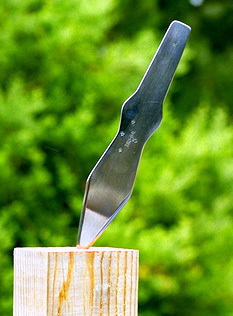 A classic, the Harry McEvoy model #79 Pro-Thrower from Tru-Balance Knife Company. 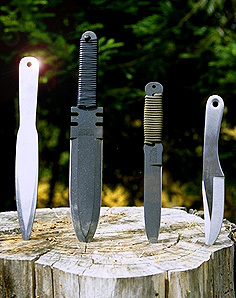 Left to right, some off-the-rack knives from Blackjack, a pair of Cold steel throwers - Warhead and True Flight Thrower (TFT) - and the original Hibben III. Of these, the Warehead has the best weight, but is much too brittle. The Blackjack is a high quality thrower and is on its way to becoming a rarity. 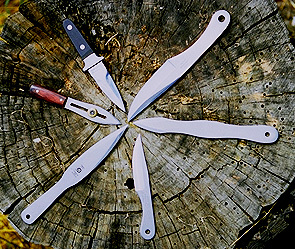 Clockwise from 11:00, a Rostfrei boot knife, a Hibben II, a target knife from Atlanta Cutlery, a Hibben I, the baby Blackjack, and a small rosewood handled knife with a moveable brass weight from Gorilla & Sons catalog. See the Catalogs link for most of these.